Liza Devaney, LCSW, completed her Master of Social Work degree at Jane Addams College of Social Work at the University of Illinois. She is a professionally trained Divorce Mediator and is certified as a Grief Recovery Specialist. As a Divorce Mediator, Liza can help couples negotiate all of the necessary issues required by the court to obtain an uncontested divorce. Divorce mediation is affordable, confidential and client driven, not court driven. 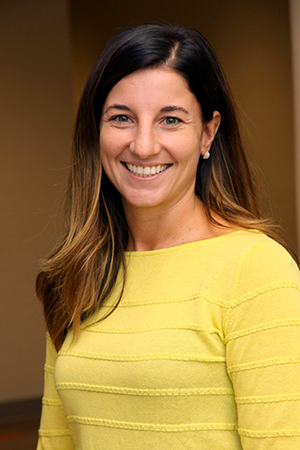 Prior to being in private practice, Liza had extensive experience working at Linden Oaks Hospital including being a clinical therapist in both the adolescent and adult programs. Liza's expertise includes a wide variety of clinical issues including depression, bipolar disorder, anxiety, grief and loss, anger management, family conflict, children of divorce, and sexual identity issues. Her therapeutic approach is a non-judgmental blending of eastern and western philosophies thereby helping clients to develop acceptance and cope with their challenges. She is adept in training clients using Dialectical Behavioral Therapy (DBT) which has been extensively researched as a potent way to treat individuals suffering severe from mood instability. She uses a variety of other therapies including Cognitive Behavioral Therapy (CBT), Acceptance and Commitment Therapy (ACT), and Motivational Interviewing to ensure the most effective form of treatment is utilized to fit each client's unique situation. Liza is a Certified Grief Recovery Specialist and can help clients deal with grief and loss issues through individual and family counseling. Wendy Pawelski, LCPC, CADC, received a Bachelor’s degree in Vocal Performance from Millikin University, a Master’s degree in Clinical Psychology from Benedictine University, a Certificate in School Counseling from Northern Illinois University (type #73), and an Addictions Certificate (CADC) from the College of DuPage. Wendy is an EMDR therapist, and is passionate about working with those suffering from PTSD. She is also trained as a divorce and family mediator, helping to empower individuals to work agreements and settlements. Along with having extensive experience in the psychiatric hospital setting, Wendy is also an independent contractor for R3 Continuum, facilitating debriefings for various companies and organizations that have undergone mass trauma or loss. She has also worked as a school counselor at Edward Academy where she provided therapy for children with Autism, Asperger’s, and other pervasive disorders. Wendy specializes in Oppositional Defiant Disorder, PTSD (EMDR), drug and alcohol abuse, mood disorders, depression, anxiety, LGBTQ issues, and self-injury. She works with tweens, adolescents, adults, and families. Currently she is running a process group for adolescent females. Her treatment modalities include Cognitive Behavioral Therapy (CBT), Dialectical Behavioral Therapy (DBT), and Acceptance Commitment Therapy (ACT). Wendy is skilled in finding the right tools to empower each client. She uses empathy, compassion, and a little bit of humor to engage her client and built rapport. She is especially skilled at building rapport and connecting with difficult to engage teenagers. Wendy understands that choosing to begin therapy can be a vulnerable time, and respects that each person has a story that brought them to this point. She is skilled at encouraging each client to explore their individual journey of personal goals and tailors their treatment to what they are looking to accomplish. Wendy works closely with families, physicians, and schools because she knows that treatment is always a team process. She is a very optimistic, upbeat, and creative individual who strives to meet each client’s specific needs. Carol Folisi, LCPC, CADC, CEAP, earned her Bachelor of Arts degree in Psychology from North Central College in Naperville, and her Master of Science in Counseling Psychology from Benedictine University. She has been a therapist for over twenty-five years and has significant experience gained from a variety of treatment milieus, including hospitals, residential programs, and outpatient services. She is a certified addictions counselor as well as certified employee assistance professional. Her treatment approach is cognitive/behavioral in general, utilizing concepts from CBT, DBT, ACT, and other treatment modalities as dictated by client needs. Carol is experienced in individual, couples, adolescent, and family counseling covering a variety of treatment issues. Carol has significant experience in working with mood disorders and alcohol/drug addiction. Her goal is to empower her clients towards successful life management by identifying and implementing the appropriate coping skills and improved perspectives. She serves individuals aged fourteen and older, but will consider children between ten and thirteen on a case by case basis. Kathryn Burkhardt Lipkin, LCPC, earned her Master of Arts degree in Counseling Psychology from the University of Missouri-Columbia. She has been a therapist in private practice since 2001. She has also worked in family social services in Missouri, outpatient community counseling in Chicago, and acute hospital based clinical therapy for both adolescent and adult services. Her clinical areas of expertise include treating depression, self-esteem struggles, anxiety, grief and loss, life transitions, and addictions. She has also been a therapist in private practice since 2001. Kathryn works with individuals to set their own goals towards establishing a more fulfilling and satisfying life. She respects and understands that people know themselves best and allows them to take the lead in finding the focus of treatment. Kathryn encourages clients to share thoughts, feelings, and struggles. She offers support, encouragement, insight, and assistance with problem solving. Together she and her clients identify barriers that may interfere with contentment, and explore ways to increase peace of mind and heart. Her approach is a very warm, non-judgmental and accepting manner with adults, adolescents, and families, across cultural backgrounds, religions, and sexual orientations. Karen Sommers, LCSW, who was born and raised in the Chicago area, is a social worker with over 30 years of experience. She received her social work degree from Loyola University in Chicago. She has worked in medical hospitals and psychiatric settings with adult and geriatric patients. She has extensive knowledge of coping with major medical illnesses as well as psychiatric disorders. Karen concentrates her work on individuals over the age of eighteen with a fondness for older adults. She has experience with clients having adjustment to illness, the sandwich generation, aging, low self-esteem, relationship, daily functioning, and marital/family issues. Karen also treats clients with psychiatric disorders including depression, mood, and anxiety. She uses a multi-model approach to treatment, with input from the client, utilizing treatment methods including CBT, DBT, and mindfulness. She is a positive upbeat person who has a strong belief that life can get better with help and support from therapy. Justin Wolfe, LCPC, CADC, CRC, completed his Master’s in Counseling with a specialization in Rehabilitation from the Adler School of Professional Psychology, and his addictions training at the College of DuPage. He is also trained as a rehabilitation counselor specializing in helping individuals with disabilities gain the skills that will help them succeed in life. Justin engages clients with a warm, empathic, non-judgmental yet direct style and uses a down-to-earth approach. He utilizes Cognitive Behavioral Therapy (CBT), Dialectical Behavioral Therapy (DBT), Acceptance and Commitment Therapy (ACT), a Client-Centered Approach and Motivational Interviewing techniques to help his clients move forward in their lives. Justin specializes in working with individuals who find themselves struggling with: depression, anxiety, addiction, defiant behaviors in teens, self-injury, self-esteem, life transitions, family conflicts, acting out/impulsive behaviors, and employment challenges. He works with clients of all ages, but has a great deal of experience working with adolescents and families. Justin strives to connect with every person and believes that each has a story and a distinct way of viewing and coping with life. He believes that building a strong and collaborative therapist-client relationship is essential to the therapeutic process. Jill King, LCPC, CADC, received a Bachelor of Arts degree in Psychology and Human Resources from the University of Iowa. She went on to complete her Master's in Counseling with a specialization in Addictions at The Chicago School of Professional Psychology. She has gained training from hospital, residential, outpatient and school settings. Having experience as a clinical therapist for both adolescent and adult intensive outpatient programs for dual diagnosis clients, Jill specializes in adolescent treatment and family dynamics. Jill was a program coordinator for an adolescent outpatient program where she created and facilitated parenting education related to adolescent development. She also has experience working at Linden Oaks Hospital as a School Liaison where she facilitates communication and advocacy between hospital and school settings. By utilizing a warm and understanding approach, while also being direct, Jill focuses on addressing unhealthy behaviors and patterns which may prevent awareness and growth for her clients. Jill encourages her clients to find their voice and strength through Cognitive Behavioral Therapy (CBT), Dialectical Behavioral Therapy (DBT), Acceptance and Commitment Therapy (ACT), and assertiveness training. Jill emphasizes establishing trust with her clients by offering respect, encouragement, and support through a non-judgmental approach. Areas of specialization include the treatment of depression, anxiety, impulsive and defiant behaviors including substance use, self-harm, and sexually acting out in teens. Jill incorporates treatment of family systems and value-based work to identify barriers with relationships with the client’s self and others.